Hmm, let's see: steampunk noir, fantastic worldbuilding, characters I fell in love with almost instantly, crime scenes worthy of Patricia Cornwell, clockwork, LOTS of sexual tension and a heart-stopping conclusion. All in a single book, my friends. Centuries ago in a land called Hy Breasil, native Ferishers and strayed humans saw marriage as a way to stop the war between their two races. Sons and daughters of the two great Courts married the conquerors in an attempt to save themselves from annihilation. Today, very little Fey blood remains and the gifts it offers are often both unwelcome and dangerous. In the great city of Dorstaad, two Criminal Investigation Division inspectors, Celeste Ritsuko and Janus Mikani, do excellent work despite the hostility they occasionally face. They are each other’s exact opposites: she, measured, well organized and precise, excellent at drawing conclusions from evidence she pedantically collects; and he, a charmer who mostly runs on intuition and solves cases using gifts his Fey blood provides. Ritsuko and Mikani begin as co-workers and friends and they remain friends. It is a wonderful thing they have, a purely platonic relationship built on trust and mutual understanding. There is attraction of course, but neither of them is willing to risk what they already have for something that may or may not work… probably not, considering Mikani’s track record. Neither of them admits, even to themselves, that they might be moving towards something more, a different kind of relationship, no longer safe, but risky and exciting at the same time. Theirs is a subtle, tentative dance, a slow-burning romance at its finest and one that will leave you desperate to know if and when they’ll take the plunge. Their characterization is superb. I find that I often use the words ‘astonishingly good’ to describe Aguirre’s work, but I can’t help it when they always apply. Bronze Gods and its characters didn’t sprout over night, they’re the result of a decade-long work, which is obvious on every page. I’ve read my fair share of crime novels and seen enough crime shows that I’m not easily impressed. I think we are all desensitized as readers and viewers, and yet these crime scenes gave me the chills. Each included a different mysterious, inexplicable device, the purpose of which was entirely unclear to Ritsuko and Mikani. I am, as I’m sure you all know, a bit demanding when it comes to steampunk. I want well-defined worlds, age-appropriate language and at least a few creative gadgets. Ann and Andres Aguirre gave me all that and more. I need book 2 more than I need air... or bread.... or...well, maybe not blueberry muffins. But close. Bronze Gods blog tour, hosted by yours truly, will be starting on the release date, April 30th. Each stop will have a guest post by Ann and Andres Aguirre and a giveaway. ;) jumping up and down for a kiss and good friendship already between them? Cool! Wonderful review Maja!!!!!! I love crime shows too, nice to hear that this book has a good mystery! Looking forward to the tour!!!!! Oooo it has been forever since I have read a really good steampunk and I think it is long overdue that I read one! This one sounds awesome. It has everything I love in a good read. Great review! I hope you have a nice weekend!! I've been meaning to pick up a book by Aguirre for sometime now. I think I might start with this book. It sounds exactly what I want from a great read. Looking forward to the tour! I am admittedly not a huge steampunk fan so this one doesn't sound like it would be for me but I am happy to see that you enjoyed it so much. It does sound like it has a lot going for it and I loved the mention of the copious amounts of sexual tension, YUM! "Theirs is a subtle, tentative dance, a slow-burning romance at its finest and one that will leave you desperate to know if and when they’ll take the plunge." Sweet, sweet review Maja and I want this..omg..I love the elements in this tale and so often the crap falls flat or the steampunk isn't really steampunk. I love that the characters engaged you and you shouted at him to kiss her! Woot! I will be picking up this for sure, delightful review you have me excited! Maja, this is a fabulous review. You got me really excited just by your review. Plus, you described the crime scences as being worthy of Patricia Cornwell's. I simply cannot resist that! I have only read one book by Ann Aguirre but you know how much I enjoyed Enclave. I'm so happy that this one worked for you. I know that steampunk is not a genre you've been fully satisfied with. I can't wait to meet this characters! It's SO rare to see functional, non-romantic relationships these days. The only other one I can think of is Pete and Myka on Warehouse 13...are you familiar? I was having to read this one slow for reasons outside the book, but I was glad it happened that way. I was able to really savor the story. Really enjoyed this one as well! I'm reading this one right now! I'm not very far, just on chapter 2 or so, but I'm liking it! I find it hard to get immersed in new worlds, it takes awhile, but I'm actually quite attached to these characters already and I'm anxious to see where things go! I'm glad it ends up being a wonderful read! Well, now ... I'm thinking I will need to read this! Don't hurt me, but I haven't read any of Ann's books. I know, I'm in Loserville. I will, though. Awesome review! I seem to have decided all of a sudden (over the last couple of weeks, maybe) that steampunk isn't nearly as exciting as I first imagined. That might have something to do with all the disappointing steampunk books that I've tried in the past. Bronze Gods, on the other hand, sounds like it might just work for me. The romance (or lack of) is exactly what I like. So yes, I'm more than convinced. Fantastic review, Maja! Thanks for the review Maja, I'm going to start this one soon. You had me at your first paragraph, romance, sexual tension, worldbuilding characters, Patricia Cornwell and a great conclusion! What could be better!? The only thing I'm hesitant on is what is steam punk? It could be an insult, I'm sorry! But I'm learning bookish stuff everyday! ;) Also the cover reminds me of Sherlock Holmes, the second film! :P Great review, Maja! I tried to start this last night but my brain was too tired. I will be reading it this afternoon, though hopefully in the sunshine :) I got my tour post all put together except for the review and guest post, I am ready to rock it! I wish I was a steampunk reader. You and Kara (NBR) makes it sound so awesome. Not that I doubt your respective expertise, mind you. But I'm a simple reader and I find the world around this genre too convoluted for my simple mind to take. This sounds so good! AHHHH! Aiiee this sounds SOO good!! I mean, steampunk noir? Yes, please, I know I would enjoy that. Especially when you factor in the perfect characterization and that amazing sound romance. Wow. I am WAY excited to read this one now - thanks! I know how much you love Aguirre's novels, but I still haven't read anything of hers. I may start with this one though even if it's an adult book because I love steampunk. And the romance sounds amazing. Hahaha, YES!! I do want this one. I feel a book buying spree coming on. :D Thank you!! Great review Maja! This sounds really awesome, and I can't wait till I get to read it. I wish had money to pre-order, lol. 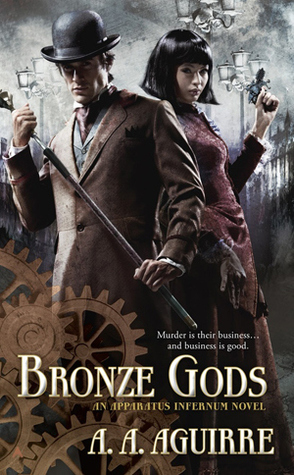 I love steampunk and am always so happy to find a good novel in the genre, to hear there's a smashing new series has sort of made my day :D Great review, Maja and good job on the blog tour.